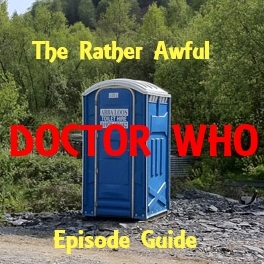 A wholly dispensable, not entirely serious guide to the television programme Doctor Who. From An Unearthly Child to The Time of the Doctor and beyond, each podcast looks at a different Doctor Who story, with plot summaries, trivia and deleted scenes that are almost entirely untrue. Almost. But for now, and for the last time at this location, here's Father's Day! The Seeds of Doom + RESUBSCRIPTION NEEDED! We're back, with a new series of 13 guaranteed weekly episodes and a new title. But that means a new feed, so PLEASE RESUBSCRIBE! But for now - enjoy the Seeds of Doom with our thanks! In a special edition of the podcast released to celebrate the 10th anniversary of 'new Who', Pete and Tim illegally download Christopher Eccleston's debut episode, 'Rose'. Hello! Just a quick podcast to let you know that we're covering the new series of Doctor Who in a weekly series of short videos on our YouTube channel, which you can find at http://www.youtube.com/skewedwho. It's like a podcast, but shorter and with pictures. Tell your friends! In the 17th episode of the podcast that 200 people every month are already calling "One of thirty Doctor Who podcasts I subscribe to," Tim and Pete will obey the Master for the first time as they watch 1971's Terror of the Autons and find nothing to worry about. Nothing to worry about... Warning: Contains inconsistent pronunciation of the word 'Master'. Please do tell your friends that we exist, if you enjoy what you hear! When it's spring again, we'll bring again, ten minutes of made-up facts about the 221st most popular Doctor Who story, as voted for by the readers of Doctor Who Magazine... Pete and Tim have never been to Amsterdam, but after watching 1983's Arc of Infinity they feel like they have, and they never want to go back. Warning: contains backpackers. Huge thanks to everyone who's been spreading the word about us this week. Everyone else, if you do, we will love you forever. Or at least until we become successful enough that we can forget about the little people. Occasional podcasters (Sorry!) Tim and Pete return FROM BEYOND THE GRAVE as they journey to a parallel universe in which there are two Noel Clarkes and zero regards for road safety as they look at the 2006 epic Rise of the Cybermen and The Age of Steel, which they feel would really benefit from a snappy umbrella title. Spare Parts, perhaps. Warning: Contains jarring and gratuitous use of pop music. Tim and Pete throw reverence out of the window as they take on their first proper 'classic' story (Sorry, Paradise Towers fans,) Pyramids of Mars! Warning: contains jokes at the expense of Pyramids of Mars. The world's twenty-seventh most popular Doctor Who podcast returns! And it's a trip back to the Swinging Sixties for Pete and Tim as they try and get down to the groovy sounds of The War Machines. Warning: Contains Dodo Chaplet, but only for a bit. Tim and Pete go all Harold Camping as they revisit The End of the World, which apparently managed to happen in 2005 without anyone noticing. Warning: Contains popular music references. We're on our way to the top! Not of the iTunes charts; that would be ridiculous. We're taking the lift all the way to the top floor as we enter the terrifying world of 1987's Paradise Towers. Warning: Contains delicious Fizzade. Pete and Tim get caught up in The Web of Fear, the heroic tale of the little dartboard that couldn't, and a bubble bath gone horribly wrong. Warning: Contains Omnirumour. It's all gone a bit King Kong as we take on Tom Baker's debut story, Dr Who and the Giant Robot! Warning: Contains Harry Sullivan. Do spread the word about us to the Doctor Who fans in your life! But don't tell the norms. All norms are our enemies. Twelve's hour is upon us - or is that Fourteen's? We reveal some never-before-heard made-up facts about Matt Smith's farewell tale. Warning: Contains no reference to The Thick of It whatsoever. In a bumper (nearly 10 minutes) Christmas special, we make up some true facts about 2005's The Christmas Invasion. Warning: Contains Jackie Tyler. We rise higher than ever before and fall even lower as we examine the Series 32 mid-season finale 'A Good Man Goes to War'. Warning: Contains leaves. We take on 1985's 'Attack of the Cybermen', starring Colin Baker before he was good. Warning: Contains Sarah Greene. Near-misses, Doctor-disses and absolutely no kisses... It can only mean one thing: Donna Noble's about to join the Doctor on board the TARDIS! We go undercover to investigate the 2008 season opener Partners in Crime. Warning: Contains bin food. The TARDIS has been fixed and the Doctor can leave Earth again, which can only mean one thing - our second Scoop-based episode in as many weeks... Warning: Contains bizarre costume design choices. The cake has been eaten, the bunting has come down and we're all nursing Whovian hangovers. But there's still time to take a look at the 50th anniversary episode, The Day of the Doctor. Warning: Does not contain Paul McGann. To celebrate Doctor Who's 50th anniversary, we begin our journey with a look back at the 20th anniversary special, The Five Doctors. Warning: Contains mind probes.